One day, you will jump off bed, painfully stubbing your toe and if that is not already a sign of the kind of day you will have, the sink won’t drain and the dog, after discovering a puddle in the yard, will track thick, muddy paw prints all over the floor. Within an hour, your toe will heal and you will somehow figure out how to unclog the drain. Kiddo, older, more observant, seeing mud on the floor, will grab a rag and clean up the mess without being asked to. You deserve to take a moment to marvel at this because right now it will feel like the most impossible achievement for the young tween in front of you. You will realize that you have to be on the road in ten minutes but that you still have not prepared breakfast, fed the dogs, made coffee, packed the bags and the lunch, and topped up the water bottles. Thankfully, kiddo will have reminded you the night before to fill the car with gas. Pause and consider that in wonder. After one incident not long from now when your child is late for a much beloved class, you will have your own, free and very prompt low-on-gas reminder service. Back to that fateful morning…as the dogs (yes, you will have two) wolf down their food, you will watch dust bunnies and coffee-sticky counter-top patches in despair, wondering how your once spotless dwelling–the pride and joy you sometimes prioritized over homeschooling history–has turned into such a dump. But you will realize that the weekend will soon be here and that you will have a pair of helpful teenage hands to wield the vacuum cleaner. The child in front of you who still trips over stairs and shoes will one day, skillfully, effortlessly, navigate vacuuming, a college schedule, a solo train ride! I kid you not. On that morning, you will send kiddo to the driveway to start the car while you stuff everything into bags and half socked feet into shoes. You will realize that you forgot something but you won’t remember what it is until you are already five miles away, stuck in bumper-to-bumper traffic stretching for miles (it will be another almost-late-to-class day). Your stomach will growl loudly enough to cause stares from the car in the next lane when you realize you forgot to eat. “Oh mom, I just remembered,” kiddo will say, handing you a container of scrambled eggs. “I made you breakfast.” You will gratefully eat a few (delicious!) mouthfuls while traffic crawls, ruffling that curly head as eggs and deep gratitude settle in your stomach. Before that day, you will have watched this child struggle with the simplest executive function skills for years and years. You will have used countless strategies, from post its to sticker charts to hive-mind group support to Google Calendar and Excel spreadsheet fridge reminders (kiddo won’t learn to use productivity apps well till a little later). You will have watched over them as assignment deadlines come and go with no assignments turned in, as countless breakfasts turn crisp and inedible, or as load after load of laundry turns moldy in the garage. You would have hugged, cajoled, chided harshly, or punished softly in the hopes that something you do will help to instill basic life skills. Scaffolding executive function skills is so hard on a parent because you do not usually see results for a long, long time. No, it is not your lack of parenting ability or what you carry in your genes. Your child needed your patience. Time to grow, to improve, to practice, to gain confidence. Once those skills take root, every feeling of failure is worth it. And some skills, well, they just take more time (as your own distractibility will attest). 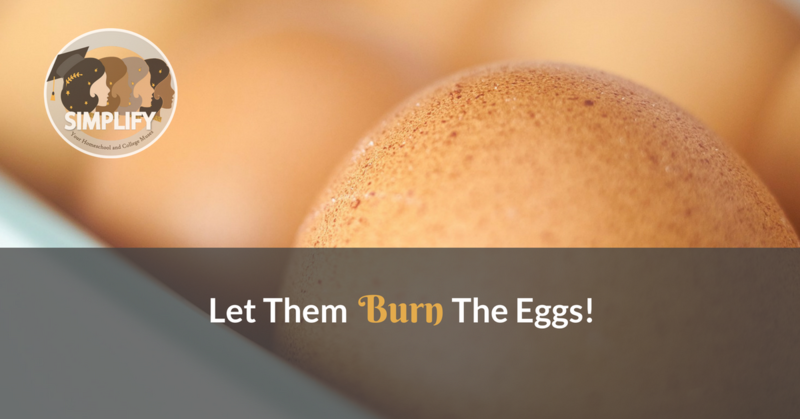 So, Suji, let them burn the eggs. Let them make the mistakes. Let them forget. Let each scaffold find its place, find strength, and grow into where it is meant to be. Because what they grow into is beautiful, special, and precious. In time, it will be…easier. Your Simplify muses are parents too. Let us know if you need guidance with executive function skills when homeschooling.